Im thrilled to introduce you to Heather from Handcrafted by Heather. She has gorgeous, unique jewelry that is sure to finish off any outfit. 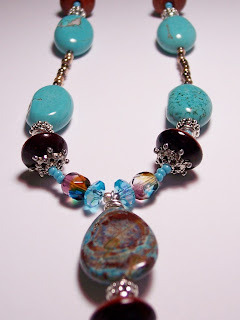 I guarantee that you will get tons of compliments when you wear any piece of jewelry handmade by Heather. I’m loving this Leopard Jasper Donut with Amethyst Jade and Czech Necklace. And how about this gorgeous Aqua Marine Swarovski with Dark Blue Pearls? I love the colors! 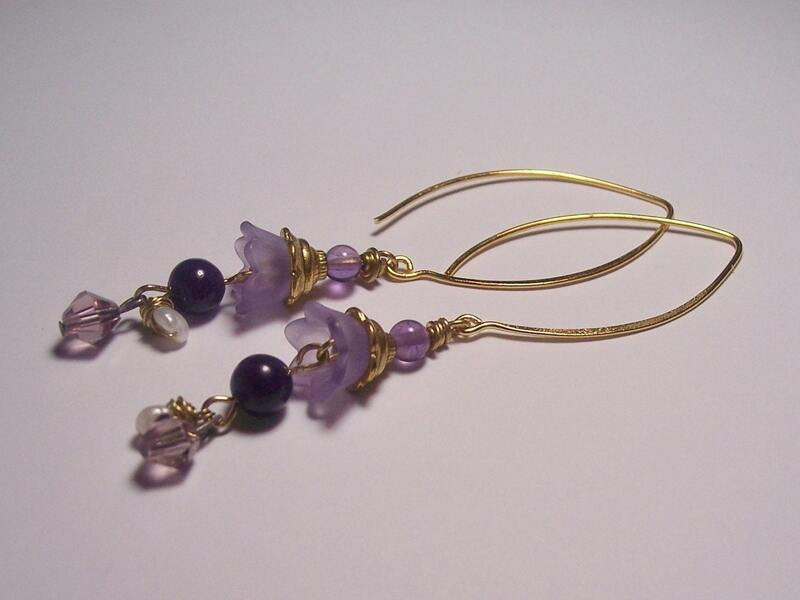 Since purple is my favorite color, I absolutely love these Purple Petal Pearl and Vermeil Earrings. 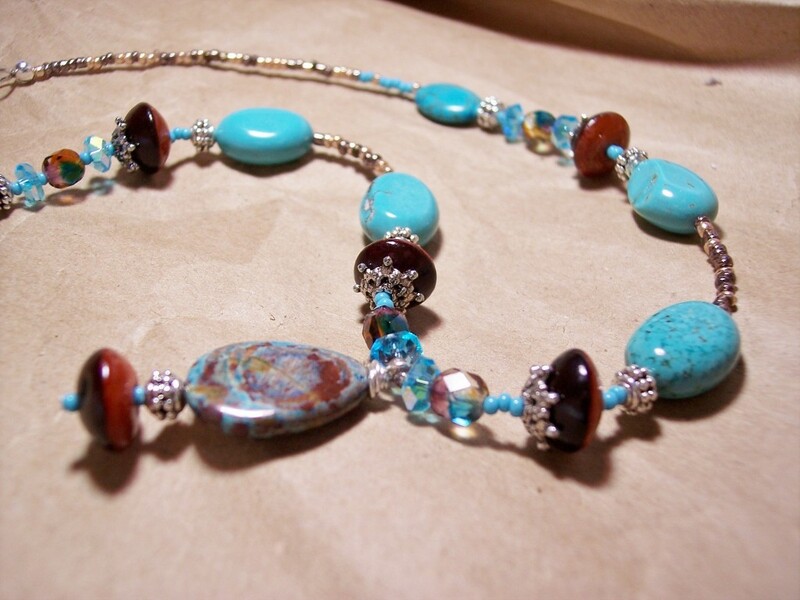 Handcrafted by Heather has beautiful necklaces, earrings, and bracelets perfect for yourself or to give as a gift. 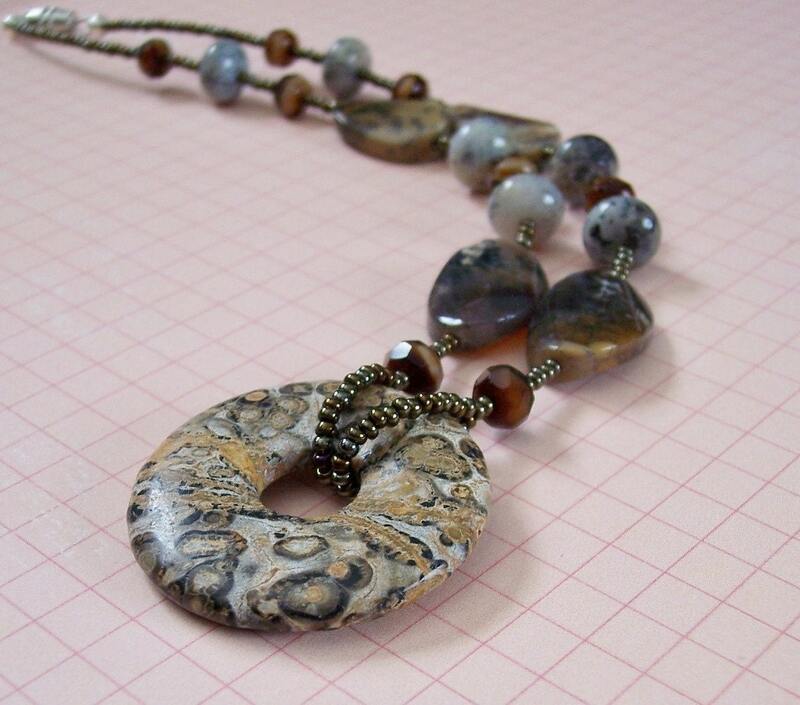 Heather from Handcrafted by Heather is generously offering one of my readers this beautiful, handmade necklace. I love the teal and brown color combination. 1. Visit Heather’s shop Handmade by Heather and comment back with your favorite item. 2. Become a follower of Happy Go Lucky or comment that you are already a follower. You have until Thursday, January 27th at 11:59 p.m. EST to enter. The winner will be announced Friday, January 28th. Please include your email address with each comment so I can let you know if you are the winner. But wait there’s more!! Heather is offering anyone that leaves a comment a 15% discount code. I will email you with the code so make sure you remember to include your email address. Good Luck and Happy Shopping!! Heather is new to Etsy so make sure you show her some love! I’m a a follower of Happy Go Lucky!!! I love the green thumb triple strand bracelet! I love the Light Rose Swarovski with Gold and Czech Glass…it reminds me of my little princess! I am so in awe of these beautiful designs. You are very talented and, I should imagine, incredibly skilled. Gorgeous jewellery. Aqua Marine Swarovski with Dark Blue Pearls and Hill Tribe Silver. It’s beautiful!! And I am following now. =) Thanks for the visit to my blog!!! love love love the http://www.etsy.com/listing/64059999/beetle-bug-pendant-necklace! but it was hard to choose, because i really like ’em all! I like the Shades of Blue Double Strand bracelet. The colors are lovely! My favorite is the Light Rose Swarovski with Gold and Czech Glass Necklace, very pretty! LOVE the VINTAGE Chain and Pearl Multi-Strand Necklace:) I am a folloower! Also like the Golden Jade and Porcelain Bracelet-very pretty. 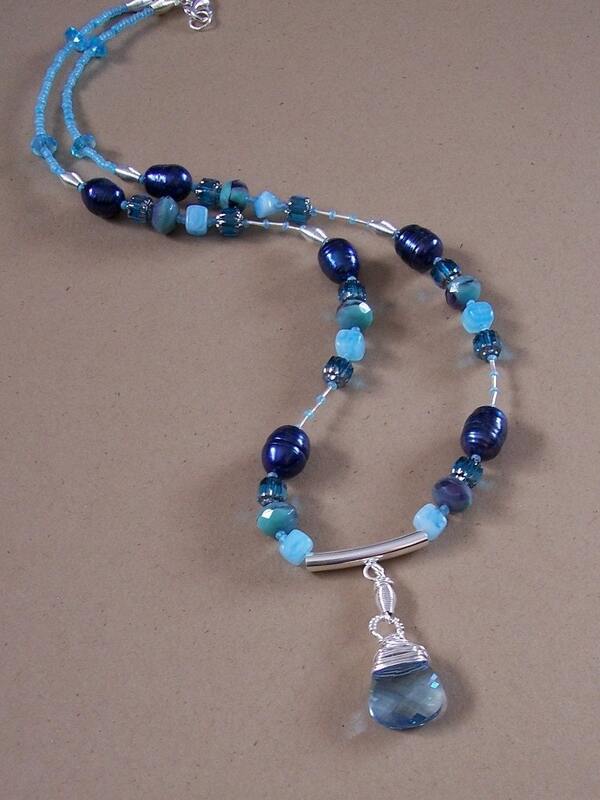 I adore Cool Hill Tribe Silver Fish with Blue and Grey Czech Glass Necklace!!! 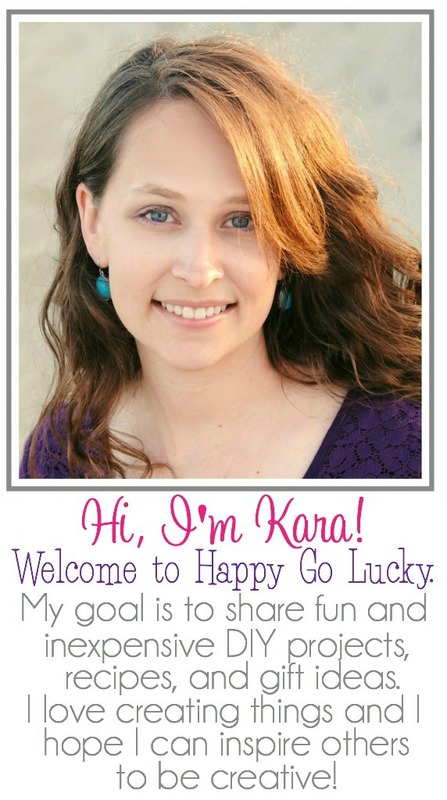 Following your blog via GFC! I love the Sophisticated Citrine and Gold Leverback Earrings – thanks so much! Blue and Grey Twisted Czech Glass Earrings are my favorites since I wear a lot of blue. Hope I win! It was very difficult but I’ve decided… My favourite is the Shades of Blue Swarovski Double Strand Bracelet… Incredibly Beautiful! Thanks for the opportunity… Lovely Giveaway! Hi! My fave item is the vintage chain & pearl multi-strand necklace :). Karen, because it reminds me of a serene crystal blue lake..
i loooooove Citrine with Garnet on Gold Chain Earrings. i am a follower from now on. i like the VINTAGE Chain and Pearl Multi-Strand Necklace. very pretty. I like Monday Blues Swirly Gig Triple Strand Bracelet. What beautiful pieces!! And how difficult to make a choice! But Shades of Blue Double Strand bracelet might be it.